Recent studies have shown how marine microalgae is rich in protein and Omega-3 fatty acids and could potentially be used to curb world hunger. Scientists have suggested that commercial production of marine microalgae, rich in protein and Omega-3, could help us face global hunger. According to FAO’s latest report on “The State Of Food Security And Nutrition In The World”, global hunger is on the rise again after a decade-long decline. The FAO estimates that now there are 815 million undernourished people in the world, mainly in developing regions, where only 777 million people were undernourished two years ago. This rise of the already sobering figure is attributed to famine striking in conflict-affected countries: South Sudan, Nigeria, Somalia, and Yemen. If over 9% of the world’s 7.6-billion-strong population is undernourished now, how would this number change in a not so far future where the Earth gets full! From the second half of the 20th century on, agricultural intensification was made possible thanks to Green Revolution technologies and practices, such as the use of synthetic fertilizers and mechanization, efficient irrigation techniques, selection of high-yielding varieties of crops, and pesticides. The Green Revolution has helped meet the growing food needs of the world population, decreasing undernourishment from 26% in the 1970s to 14% in 2000s. By 2050, we’ll be around 9.2 billion people strong, and by that time the FAO estimates that the global agricultural production must be increased by an average of 70% (100% in developing countries) to meet food needs alone. To feed this galloping population growth, the world needs to produce annually an extra 200 million tonnes of meat and a billion tonnes of cereals by 2050. World organizations regularly issue warnings and raise awareness about food waste, calling for intensive production of GMCs (genetically modified crops), the spread of organic agriculture, and other measures to feed the world. Other meat alternatives have been proposed, such as insect proteins and in-vitro meat, which have drawn media and public attention. But consumers seem to be still hesitant to adopt these new protein sources as staple foods into their diet. Now, specialists are looking at marine microalgae, an abundant and quality food that’s waiting to be harvested. According to the findings of recent studies, our omnivorous lifestyle could have helped our ancestors survive for a long time. And that makes sense, as omnivorous species would likely be the last to go extinct as their diets are much more diversified than herbivores and carnivores. New research is calling us to further exploit our omnivorous nature and include yet another untapped food resource: marine microalgae. Algae constitute the bottom chain of the vegetable kingdom, and perhaps as a sign of that low position, they don’t have leaves or roots. Macro and microalgae are autotrophic organisms, that is to say, they’re able to develop by photosynthesis. They differ both in size and molecular structure, with macroalgae already being used in many Asian cuisines, such as seaweed in sushi. Algae is a rich source of protein and Omega-3 fatty (healthy) acids that, even if they can’t eradicate hunger from the world, would at least help to significantly reduce undernourishment and address food shortage in the future. 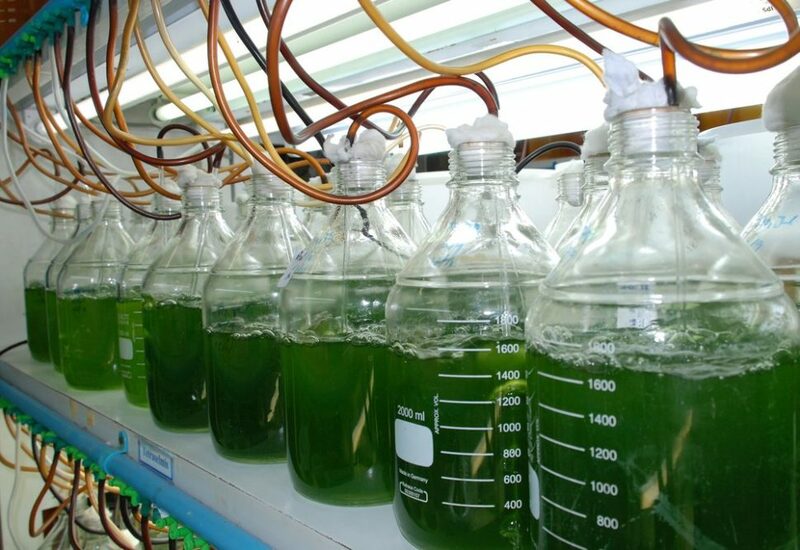 Commercial production of marine microalgae could also provide a practical use for brackish water. According to authors of the study, published in Industrial Biotechnology, cultivating marine microalgae in a brackish/marine water may be the best sustainable production system. Are you ready for a future where our meals are ultraconcentrated microalgae pastes? Currently, the most efficient crops are corn, soy, potatoes, peas, lentils, beans, peanuts, rice and a few others. These are able to produce the most calories & protein using the least land. Algae has the potential to be even more efficient. That could mean less forests have to be cut down to make room for farmland. And less people would go hungry. Maybe less pesticide and fertilizer needed too. But for that to happen, algae would have to be a lot cheaper. Someone will find a way to turn it into tasty foods and snacks. Right now, algae is a lot more expensive than grains and legumes. Maybe water tanks just cost way too much per square kilometer? Anyway, that’s the main problem to solve. If we can reduce the costs – both economically and envionmentally including building materials – then algae has great potential to solve the world’s problems.